In this hands-on workshop you will learn how to design and make a beautiful silk flower head wreath to go along with your sugar skull face painting*. These head wreaths can also be used for many different occasions throughout the year, such as Mayday, summertime festivities, Renaissance Festival, weddings, photo shoots and more. It’s a versatile skill to know. All materials are provided for this class. There will be a lovely selection of silk flowers and ribbons to choose from. 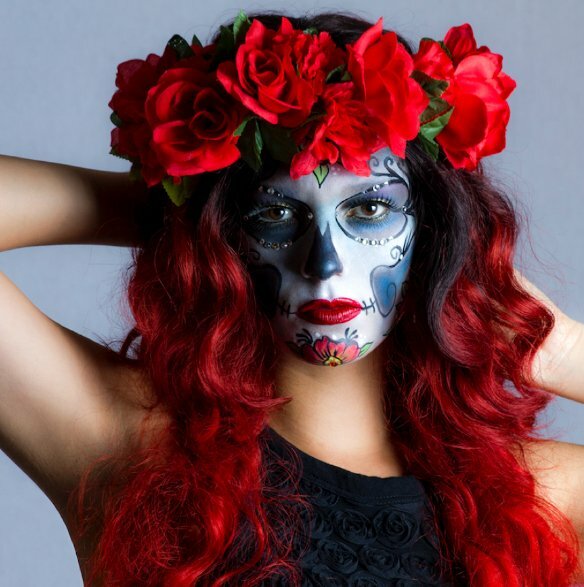 *There is a companion Sugar Skull Face Painting Workshop that will teach you everything you need to know to design and paint a beautiful Sugar Skull face for Day of the Dead. This is offered on October, 4th (Class #1018-01) or you may also sign up for this class as a stand-alone workshop. Cost for this 2-3 hour workshop is $35 total: $20 workshop fee, plus an additional $15 materials fee, payable to the Instructor the day of class. Instructor: Sophia Rose – Sophia is a professional body & face painter, photographer, artist, and amazing crafter; she does it all! She does incredible work, and her body & face painting work has been featured on magazine covers! Minimum 3 students, maximum 10 students. If the minimum number of students is not reached, the class will be cancelled and a refund issued. Online ticket sales will end 48 hours prior to event. If ticket sales have ended, you may call the store to inquire about availability.